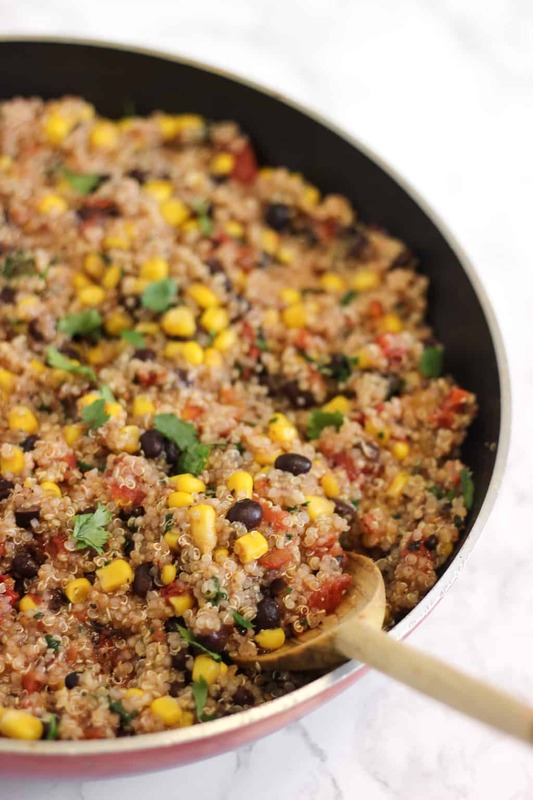 No chopping or sautéing, no cutting boards or mixing bowls to wash…this one-pan Mexican quinoa is SO easy to make. Just dump everything in the pan, let it cook, and enjoy! I like going out to eat, but I really love staying in and cooking. This semester, a couple of friends and I started a Sunday night tradition of cooking dinner together. They live together in a house right off-campus, so I usually go to them since they have a kitchen to themselves and I share a dorm kitchen with 50 other girls! We all love fresh, healthy foods, and one friend is a vegetarian, so we usually cook healthy vegetarian meals together. So far, we’ve gone with a beans, greens, & grain theme each week! For example, for our first dinner, we made really yummy Buddha bowls with roasted sweet potatoes, roasted broccoli and cauliflower, quinoa, and roasted chickpeas/black beans. 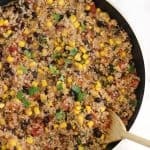 We started texting last Saturday about ideas for what to make that Sunday, and I found a basic recipe for Mexican quinoa. It looked inexpensive and simple, which are my two essential criteria for college cooking. We had most of the ingredients on hand already, and I stopped by the grocery store on Sunday afternoon to pick up quinoa, lime, and corn, plus an avocado to make guacamole. When I arrived, we just added everything to the skillet and then played a couple rounds of cards while we waited for dinner to be ready. The original recipe we found didn’t include any spices, and the water to quinoa ratio was a bit off, so we ended up adapting the recipe to come up with our own version. Before digging in, we topped our Mexican quinoa bowls with guacamole, salsa, lots of cheese, and plain Greek yogurt instead of sour cream since that’s what we had. We all loved it! I knew I wanted to re-make this one-pan Mexican quinoa to take notes on what we did and take a few photos to share on the blog, so I made it again this weekend in my dorm kitchen. I didn’t mind eating it two weekends in a row one bit. Since then, I’ve ended up loving this Mexican quinoa for weekend meal prep! Since there’s no meat, it tastes just as fresh and delicious on Day #5 as it does on Day #1. I pack a big serving of Mexican quinoa in a glass Tupperware container and top it with a sprinkle of cheese and a spoonful of salsa, and then either heat it up at school or eat it cold for convenience. I’ve also skipped the cheese in order to pack it for a day-long hike when I knew my food would be out of the fridge for quite a while. Either way, it’s delicious! • The amount of water required for the quinoa may vary a bit depending on how much juice is in your can of diced tomatoes, so add an additional splash of water to your quinoa while it’s cooking if needed. • Check on the quinoa at the halfway point and when it’s almost done cooking and add more water if needed. Draining extra water at the end is much easier than scraping burnt quinoa off the bottom of the pan if your stove is a bit hot and the water runs out! • Be sure to use diced tomatoes instead of crushed tomatoes. I’ve made the mistake of switching the two, and it wasn’t the end of the world, but they’re a different consistency. Crushed tomatoes have a similar consistency to pasta sauce, while diced tomatoes are chunks of tomatoes. • You can cook quinoa in vegetable broth for more flavor, but I used water each time and it was still delicious! Feel free to use whatever you have. • The toppings really make this dish, so don’t skip those! I used sliced avocado for the photos, but I actually ended up adding cheese, salsa, guacamole, and plain Greek yogurt/sour cream. If you try out this one-pan Mexican quinoa, feel free to let me know in a comment or take a picture and tag me @livbane on Instagram. Hope you enjoy! 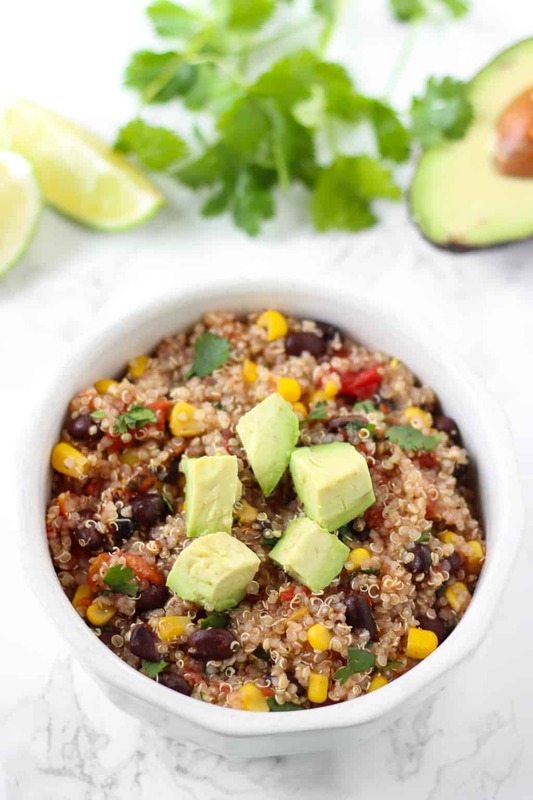 This one-pan Mexican quinoa is super easy to make– no chopping or sautéing, no cutting boards or mixing bowls to wash...just dump everything in the pan, let it cook, and enjoy! Toppings: guacamole, salsa, sour cream or plain Greek yogurt, cheese, etc. 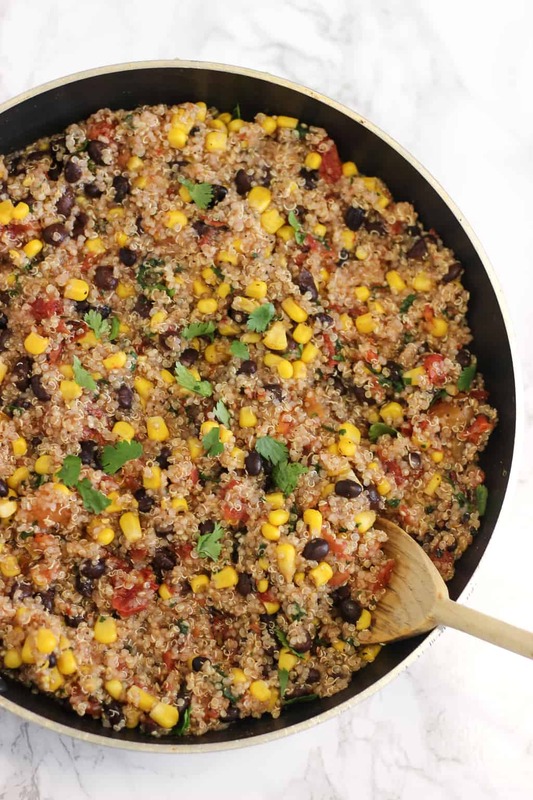 Add quinoa, water, and diced tomatoes to a medium skillet or saucepan. Bring liquid to a boil and reduce heat to simmer on medium-low, for 12-18 minutes or until quinoa is done (it "pops" open) and liquid is absorbed. Add an additional splash of water while cooking, if needed. Stir in black beans, corn, lime juice, and spices to taste. Spoon into bowls and serve warm with guacamole, salsa, sour cream or plain Greek yogurt, cheese, etc. Store leftovers in fridge for up to five days and serve warm or cold. I love how you and your friends cook dinner together once a week; I also love really simple dishes, and Mexican food seems to have some of the easiest, throw together meals. And the flavors are always UNREAL, AMAZING! Wow, Liv, you are psychic or something. I was thinking of a quinoa dish for dinner this evening and boof, there you are with the perfect offering. Thanks. Nice to have dinner all planned out ahead of time and we have the ingredients on hand. Cool. No way! You’ll have to let me know what you think. I was thinking about posting this tomorrow but I’m glad I went ahead and posted it today! Hi, Liv, sorry for the late follow up. We loved this recipe. I think I am making my wife into a quinoa fan as well as myself. I saved this for last Wednesday, Ash Wednesday, a no meat day for Catholics. It was perfect and we had it again for Friday, which are no meat days during Lent as well. It’s also great as a leftover for lunch. Looking forward to trying more quinoa dishes. Woohoo, so glad to hear you and your wife enjoyed this!! Thanks for reporting back! 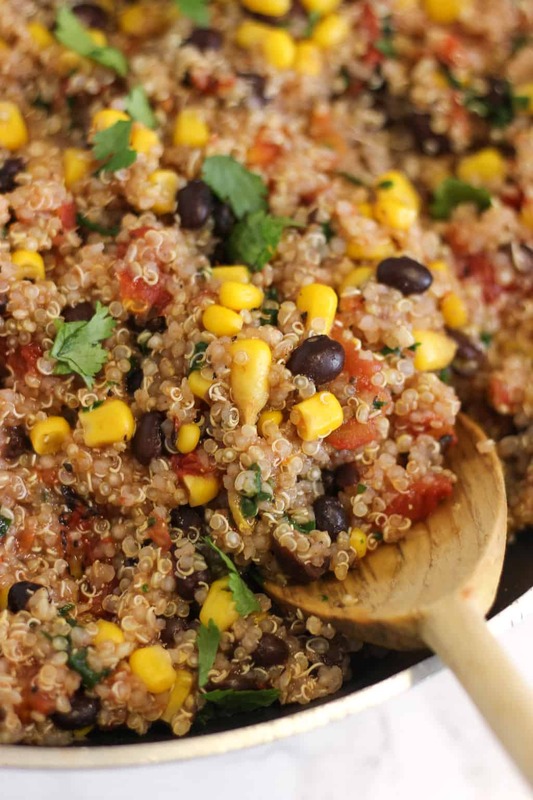 We love anything mexican inspired – and anything with quinoa so this looks PERFECT! Your cooking get togethers sound like so much fun! What a great idea. It’s really fun to have friends in college who love cooking similar foods, too! Liv!! I love your Sunday night tradition of cooking with your friends!! It’s so so fun to cook with those you care about! It’s a great way to bond, get yummy food & save money!! Love it! Also- loving this recipe! Only 5 ingredients??? YES please! Agreed– bonding + yummy food + saving money are all good things! LOVE one pan meals…the less dishes the better- HA! Love that lots of healthy foods naturally have so many bright, pretty colors! This looks so good! and I actually have all these ingredients already (except the cilantro..) so I guess that’s a sign! I should probably make this soon! Thanks for sharing! I love mixing a lot of ingredients into quinoa. I feel like it’s such a staple for me! This sounds so good. Love the idea of using it for a Chipotle-type meal!! I think quinoa is a little bland by itself so I love adding lots of mix-ins and toppings. So good! I just made this and it’s wonderful! I added in onion and red bell pepper because I was feeling a little ~saucy~ and it was delicious!!! Liv, you’ve done it again! Thanks for the yummy dinner! I used veggie broth and subbed Trader Joe’s frozen roasted corn for the canned. The only spice I used was TJ’s Chili Lime Seasoning. Served with avocado and it was perfect. Wow this was fast and easy! Y en español como lo puedo ver, gracias!!!! Hi, Looks great, Was wondering if you can freeze this dish? Hi Lina! You sure can! Wow! All the reviews on Pinterest were glowing but I was still suspicious, since I’m not a huge fan of Mexican, but I had all the ingredients so I decided to give it a try. SO GOOD. The corn was amazing for crunch and sweetness, as well as the toppings. You’re so right there! My one problem was that it was hard to season after cooking; I found my dry spices just clumped into the quinoa and didn’t spread around, so next time I’m going to season the cooking water and see how that goes! I’ll continue to add the lime juice afterwards. I used fresh tomatoes on top instead of cooking with canned, and avocado, red onion (perfection), and sour cream. My hubby is going meat-free for January so I’ve been trying out new recipes. He absolutely loved it too, especially because he can add whatever heat to it he wants (lots of salsa, extra taco seasoning, extra lime juice, and NO onions LOL!). We did NOT miss the meat at all. My 5yo tried it and ate it, although he wasn’t convinced he liked it, haha. The 2yo rebelled totally. (I’m not worried; they’ll eat it when they’re 6′ tall and starving, ha!) But I think you should earn a blue ribbon for this! 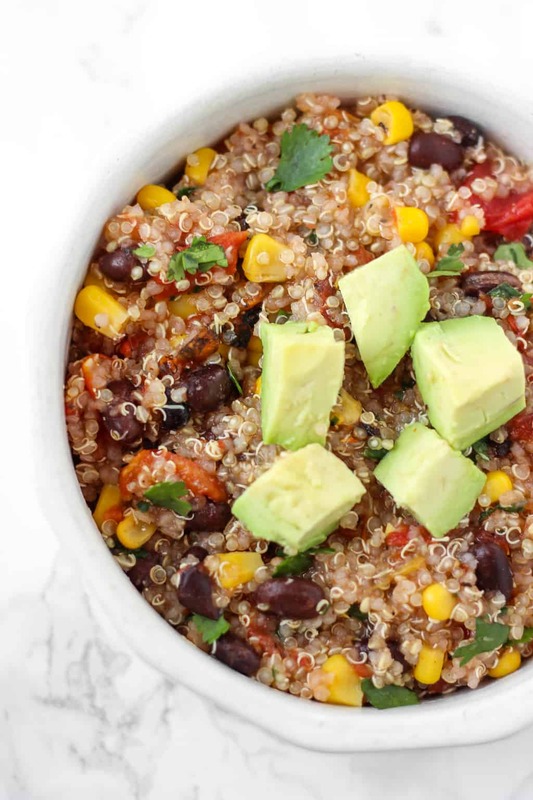 I’m so glad you enjoyed this Mexican quinoa and that you picked this recipe for your first time making quinoa!! 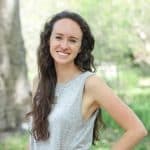 Hi, Jordan! Yes! Quinoa tends to freeze quite well. Are you kidding me?!!! This was sooo easy and absolutely delicious!!!!!! Thank you so much for the recipe! Yay!! So glad you love this recipe, too, Lynda! Thank you for the recipe. I am starting WW and am trying to figure out the points value. In addition to the nutritional info. you’ve already given, do you know the saturated fat and sugar amounts? Also, how much is a serving size?